THE FILM FESTIVAL SCREENING OF HIGH SCHOOL STUDENT FILMS WILL BE HELD MAY 28, 2013 AT THE WASHINGTON TOWNSHIP UNITED ARTISTS 14 THEATRE. DOORS OPEN 9AM. FILMS BEGIN 10AM. AWARDS BEGIN 12:30PM. ENDS 1PM. That is the mission behind this year’s 2014 10 Day Film Challenge. 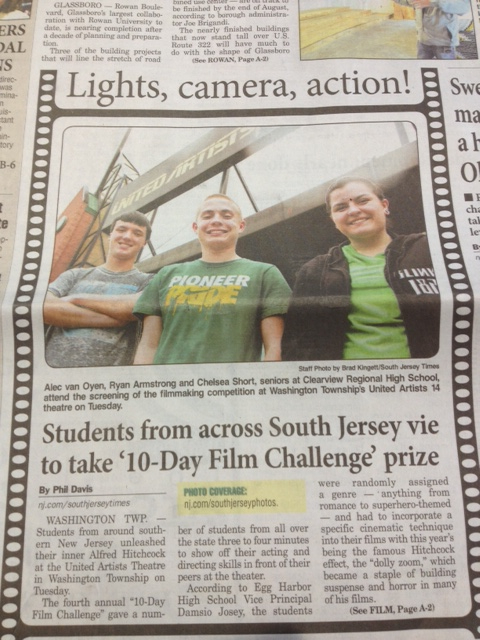 From April 28 – May 9, 2013 film students from 25 high schools from around the state of NJ used 10 class periods to create a 3-4 minute original short films. Over 100 films were made and the Top 30 of these films will be screened competitively at the Washington Township United Artists 14 theatre on May 28, 2014. 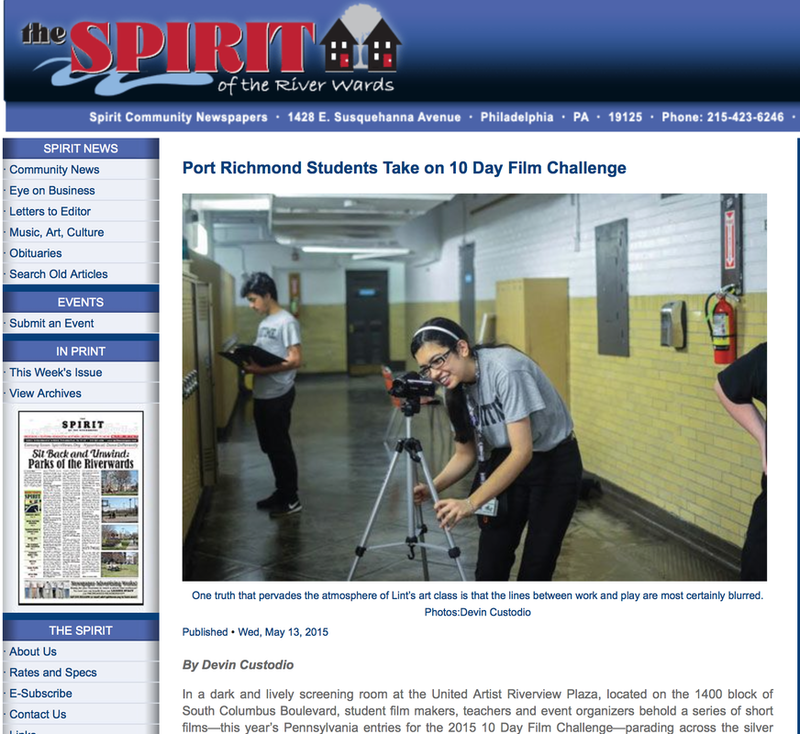 Creating a short film in only 10 days was not the biggest challenge for these students. On the first day of the Film Challenge, these students were given a specific genre, a character’s name and occupation, a prop, and a line of dialogue that had to appear in every film in every school. 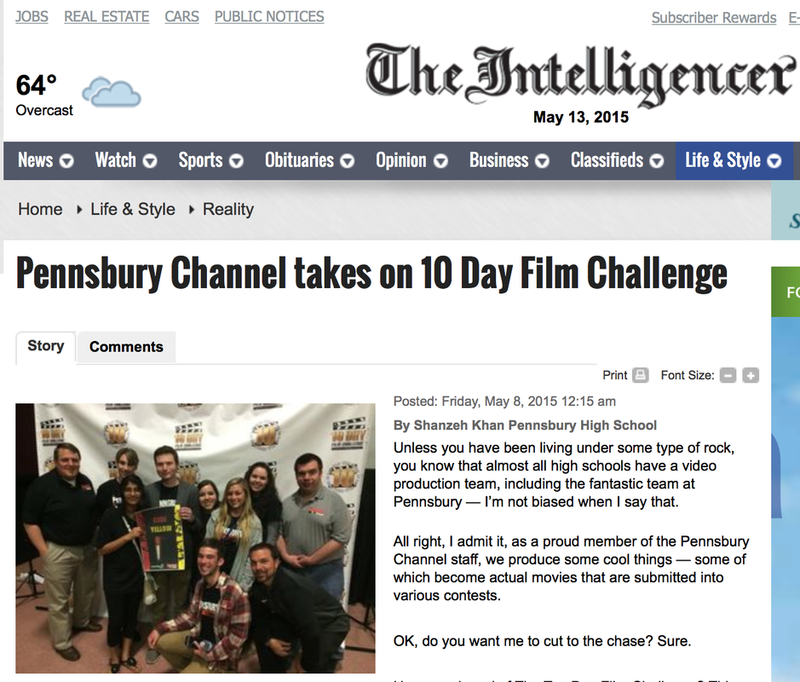 According to Hammonton film production teacher Gary Joseph and co-producer of the Challenge, this adds an extra element of pressure for the young filmmakers. “On the first day, the students’ heads were spinning. Once they receive those required elements, they worked with their group mates to quickly come up with a plot, script, and shooting schedule to get this film finished in only 10 days. It was great to see them work together under such a tight deadline,” Joseph said. Joseph also appreciated the collaborative efforts the students will endure to create a quality film. According to Joseph, the students learned a lot more than just filmmaking skills throughout The Challenge. “I know the students made some nice movies. It was great, but the best thing for me was seeing them work together to problem-solve and troubleshoot in order to meet a deadline. These are great life skills that our students learned through this process," Joseph said. Overall, the Top 30 films have been selected to appear at the United Artists Theatre from over 100 total films created in the 25 NJ schools. Awards will be given in categories like best cinematography, best editing, best music, and best screenplay among several others. According to GCIT’s film teacher and co-producer of the Challenge Mick McCleery, it will be nice to see the kids rewarded for their efforts. “All of these kids worked hard for ten days under a ton of pressure to make a film worthy to be screened in public. It’s not an easy thing to do. Seeing all of these students recognized for their accomplishments will be great. It’s something they will remember forever,” McCleery said. Looking for the 2012 Press? Click HERE. Looking for the 2011 Press? Click HERE.